When the song of the angels is stilled, …. Then the work of Christmas begins: To find the lost, To heal the broken, To feed the hungry, To release the prisoner, To rebuild the nations, To bring peace to others, An alas, to make music in the heart. — Howard Thurman. I thought it only fitting in this first day after Christmas and when many of us begin the process of developing resolutions and plans for 2018 that we take some time to read Dr. Thurman’s poem and the Bishop’s message. 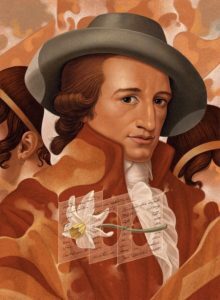 Each of us has a role in the work of Christmas that just ended, take a little time to ask yourself where your place might be in that work, and then as Goethe suggests, Whatever you can do or dream you can, begin it. Boldness has genius, power, and magic in it.